Scap Cicero spent the first 22 years of his career as an electrician in regions including Italy, Zambia and Zimbabwe. He visited the United States in 1980 to fish a B.A.S.S. Federation tournament, establishing the first team from Zimbabwe to compete in an American tournament of this type. He enjoyed the experience and returned for several more tournaments – catching plenty of fish, along with motivation and passion for the ‘American Dream’. He moved his wife Shirley and two children Giancarlo and Loredana to the U.S. to pursue entrepreneurship in 1984. 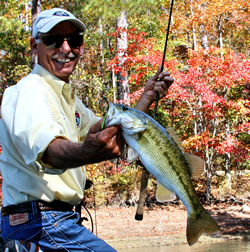 Settling in Alabama, surrounded by lakes and a healthy bass fishing industry, he spent the next 22 years at the helm of his thriving family-owned boat business. An authorized dealer of bass fishing boats, he managed everything from new and used boat sales, storage, parts, servicing and accessories for all major boat and engine lines. His reputation for attention to detail and superior customer service led him to be one of the top ten boat sales and servicing centers in the Southeast. After transitioning out of the boat business in 2004, the new company “Product Innovations, Inc” was formed so that Scap, with the help of his wife Shirley, could continue to invent and develop products to enhance and improve the avid fisherman’s experience. He first invented the Transducer Shield & Saver® in the mid-90s and pursued the opportunity to acquire a Patent, engineer and manufactured the product for market. Since the original “SSC” Transducer Shield & Saver® models, the line up of products has grown by leaps and bounds. Electronics and Transducers have changed and grown a lot. Finding ways to install transducers so that they work properly and protecting them at the same time is Scap’s “forte”. The most recent Transducer Shield® addition to our website is for the Humminbird® Onix Side Image transducer and coming soon is for the Garmin® Down-Vu and Down/Side Vu transducers. Transducer Shield & Saver® products are available at Bass Pro Shops, Cabela’s, many Boat/Marine Dealers and Service Centers and Trolling Motor Service Centers throughout the US and Canada. A Dealer Locator has been added to the website. Please check it out and support your local dealer. Anita, Sandy, Theresa and Shirley are the extremely knowledgeable and helpful ladies in the office. It is very important that orders are filled and shipped in a very timely manner. Products are shipped as far away as Australia, Africa, Europe and Japan. Loredana is our behind the scenes Facebook and Marketing Queen and “whatever needs to done young lady”. We wear many hats and enjoy the work that we do because we know the products we sell are quality products that really work! America is still the land of opportunity and we are Blessed to live in a country where the sky is the limit. Oh yes, the family has grown to include a very handsome son-in-law “Mark” and a gorgeous daughter-in-law “Sara”, four beautiful granddaughters and the latest addition “a grandson” to keep the Cicero name going!